“Ajuaaaa!” Don’t mind me while I scream in a very northern Mexican fashion. Perhaps it’s the kick in this salsa I’m drinking eating that’s making me extra festive! a charbroiled cheeseburger or one of my all time favorite foods enchiladas potosinas, I was spoiled with some pretty damn good meals throughout my child and adulthood. Unfortunately, for me the days of countless amounts of cheese, corn and sazon are over. My body has reached it’s limit and I’m very careful about what I put in it. Never fear! I plan to recreate a lot of these nostalgic-inducing meals, but without the ingredients that tend to cause problems for many. If you’re anything like me, you want variety in your meals. I personally refuse to have the same boring “healthy” food every day. I want flavor. I want to feel like I’m traveling to a new country with every meal. And, dammit, I want all of those things now! So, sit back, grab your favorite chip (kale or otherwise) and read on, cause you’re in for a treat. In this post and all over the blog, you’ll find new and invigorating recipes along with short anecdotes that will make your traveling heart pitter patter and make your mouth salivate. I hope you enjoy! The recipe I’ve chosen for my inaugural post is one that I am well known for. You don’t understand. It’s a pretty big deal. But first, I need to give credit where credit is due. You see, I learned this recipe from my dad and mom – mostly my dad. I’ve been watching Leonardo make this salsa my whole life. It’s pretty amazing what you can pick up as a kid. If you don’t know many home cooks, I’ll tell you one thing about them: they have NO RECIPES. No one writes anything down and you’re left to wonder what exactly is in this? After years of attempts and also never writing the perfect recipe down myself (until now, of course), I’ve nailed it down. 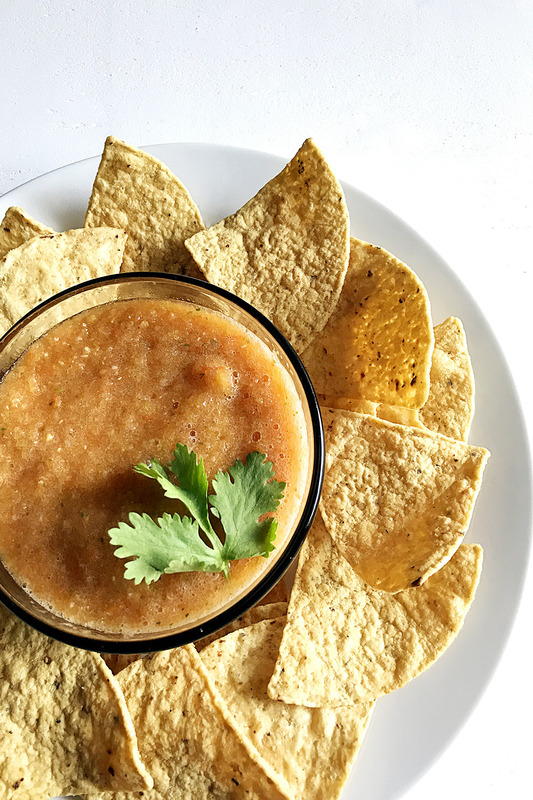 The recipe below is a nod to my childhood, as well as to all the people that have continuously praised Leonardo’s (and then my) salsa, and, of course, to everyone that has ever asked me for the recipe. Here it is, finally! I hope it brings you as much happiness, watery eyes, and runny noses as it has to me. This salsa’s deep, robust flavors end with a swift kick in the mouth. It’s a sure fire addition to your Mexican dinners! Wash peppers, tomatoes and cilantro. Cut off pepper stems and weird navel part of the tomatoes. Cut tomatoes in half. Peel off outer garlic “paper” and cut off the tops. Same goes for the onion, but be sure to cut the onion in half. 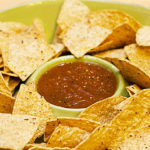 This step is important in establishing a robust and flavorful taste profile in the salsa. One of these guys will work best for the stovetop. If you don’t have one – no worries – you can roast the veggies in any standard oven; it just might take a bit longer. If roasting in the oven, set it to 425°F and keep an eye on them until they’re charred. Let the oven rack heat up a little on the stove top then place peppers, onion, garlic cloves, and vine/plum tomatoes on rack. You will probably have to do this several times until you roast everything. Rotate them so they get evenly charred. If you need to, separate onion layers to better char them. Toss all roasted and un-roasted veggies into a medium pot with water. Make sure water quantity is no more than 1/3 of the vegetable height in the pot. Add salt – start with a tablespoon. Cover. Set the flame on the stove to medium-high until the water starts boiling (10-15 min). Once it’s boiling, set the flame to low-medium (closer to low). Smash the veggies with a large spoon in the pot and get ready to taste test pure deliciousness! Add more salt, if desired. Remember that not all the flavors are infused at this point, but you can get a good feel for what the level of saltiness is. Cook for another 10-15 minutes or until the onions are semi-transparent and easy to cut through with a spatula or spoon. After all veggies are cooked, add 3/4 of the cilantro and reserve the rest to garnish. Transfer the salsa into a blender or food processor and blend to desired consistency. Be sure to blend through all that awesome garlic – that flavor needs to cut through the kick from the serrano peppers.